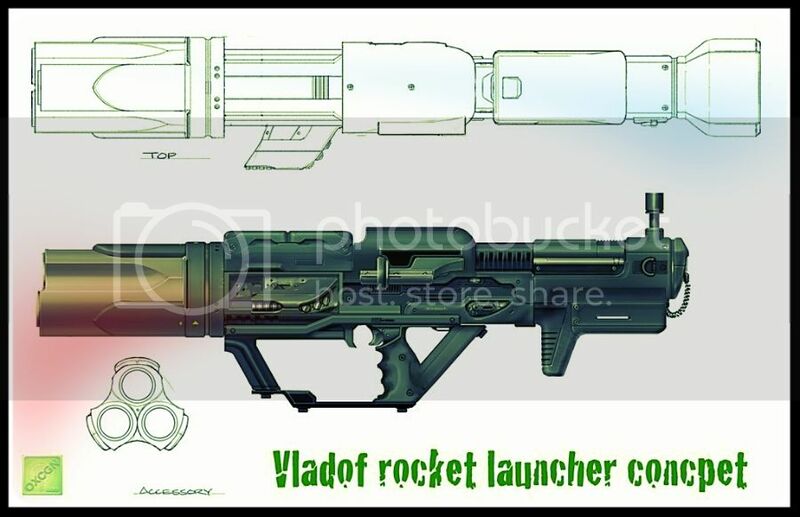 The Roaster (rocket launcher)- it has no special effect, apart from being guaranteed incendiary. Furthermore, it has no limitations on the parts it can spawn with. It should simply be used according to its barrel type (Helix, etc.). Because of the weapon's lack of effect, and lack of Title or Prefix, The Roaster is, at best, just as good as the equivalent Rocket Launcher, but never better. Lastly, it can spawn with the Rhino barrel. Rockets cannot have an explosive accessory since they are already explosive by default. I am not sure if you can use the very base weapon stats [below] to calculate changes made by weapon parts, as some weapon parts only appear to work if you have the correct manufacturer/material. However, I have listed the base damages by manufacturer on this page, so the parts can be considered more reliable to use at the very least. On top of the modifiers below for manufacturer types, there are also material types, and modifiers for each corresponding manufacturer. These are represented as "gd_weap_shared_materialparts.ManufacturerMaterials.Material_Manufacturer tag from below table_Level Number"
There are also some base damage changes, depending on the Manufacturer of the base weapon. acc.acc1_Recoiless - 300% - - 300% "Recoiless"/ increases accuracy and greatly reduces recoil. acc.acc2_Evil - - - 2 - "Evil"/ increases the fire rate, increases the projectile speed and adds tech. acc.acc3_Corrosive - - - 2 - "Corrosive"
acc.acc3_Shock - - - 2 - "Shock"
acc.acc4_Devastating 35% - - 1 - "Devastating"/increases damage and adds tech. acc.acc5_Explosive - - - - - "Explosive"
acc.acc5_Incendiary - - - 2 - "Incendiary"
Barrel.barrel1_3shot -20% - - - - Add 1 rounds, [3shot] makes the launcher fire a single rocket with a 3-round clip. Barrel.barrel1_helix -20% - - - - Add 1 rounds. Add 2 projectiles per shot, makes the launcher fire helix rockets, which are three small rockets traveling in a spiral pattern. Barrel.barrel1_spread -20% - 600% - - Add 3 rounds. 500% burst fire count/ makes the launcher burst fire five rockets in a horizontal pattern. Barrel.barrel1_triple -20% -200% 300% - - Add 1 rounds. 300% burst fire count, makes the launcher burst fire three rockets in a normal, straight forward pattern. Barrel.barrel1_Vladof_Mongol -20% - - 2 - Add 7 rounds, Fires a single rocket that shoots out smaller rockets as it flies, uses 3 ammo per shot. Barrel.barrel2_2shot - - - - - Same as [3shot], but [2shot] makes the launcher fire a single rocket with a 2-round clip. Barrel.barrel2_Hyperion_Nidhogg 100% - - 5 - 75% reload speed. "Nidhogg"/ Fires a single rocket that air-bursts into smaller rockets in a wide spread pattern. Barrel.barrel2_Maliwan_Rhino - - - 4 - Fires elemental rockets that cause repeated procs as they fly. Barrel.barrel4_1shot 25% - - - - Add -1 rounds, [1shot] makes the launcher fire a single, very powerful rocket with only a 1-round clip. Barrel.barrel4_Torgue_Redemption 120% - - 2 - Add 2 rounds. Increase Blast Radius/ Decreased rocket velocity. "Redemption"/Fires a very slow but extremely powerful rocket with the largest splash radius, uses 4 ammo per shot. Body.body1 -8% - - - - "RPG"
Body.body3 -15% - 30% 3 30% "SPC"
Body.body5 20% - 50% 1 20% "RWL"
Grip.grip1 - - - - - "Vladof"
Grip.grip2 - - - - - "Dahl"
Grip.grip3 - - - - - "Maliwan"
Grip.grip3_Gearbox - - - - - "Maliwan"
Grip.grip4 - - - - - "Torgue"
Grip.grip5 - - - - - "Atlas"
mag.mag1 - - - - - 10% reload speed, slightly faster reload speed. mag.mag3 - - - - - 30% reload speed, faster reload speed. mag.mag4 15% - - - - -30% reload speed, increased damage and slower reload speed. mag.mag5 - - - - - Add 25% clip size. 40% reload speed, increased clip size [when possible] and the fastest reload speed. Prefix.Prefix_Acc1_Recoiless - - - - - "Recoiless"
Prefix.Prefix_Acc2_Evil - - - - - "Evil"
Prefix.Prefix_Acc4_Devastating - - - - - "Devastating"
Prefix.Prefix_Barrel_Helix - - - - - "Helix"
Prefix.Prefix_Barrel_Spread - - - - - "Spread"
Prefix.Prefix_Barrel_Triple - - - - - "Triple"
Prefix.Prefix_Basic1_Rocket - - - - - "Rocket"
Prefix.Prefix_Quality1_Big 6% - - 1 - "Big"
Prefix.Prefix_Quality2_Massive 9% - - 1 - "Massive"
Prefix.Prefix_Quality3_Colossal 12% - - 1 - "Colossal"
Stock.stock2 - - - - 40% -30% reload speed, reduced recoil and slower reload speed. Stock.stock3 - - - - 30% reduced recoil. Stock.stock4 - - - - 80% -20% reload speed, greatly reduced recoil and slightly slower reload speed. Stock.stock5 - - - - 100% gives the largest recoil reduction. Title.TitleM_Hyperion1_Nidhogg - - - - - "Nidhogg" "Airburst Rockets"
Title.TitleM_Maliwan1_Rhino - - - - - "Rhino" "The Unstoppable Force"
Title.TitleM_Torgue1_Redemption - - - - - "Redemption" "Monster Kill!" Title.TitleM_Vladof1_Mongol - - - - - "Mongol" "Beware the Horde!" Title.TitleU_Retail_Leviathan - - - - - "Leviathan" "It rises!" Title.TitleU_TaylorKobb_TheRoaster - - - - - "The Roaster" "Gonna cook someone today"
Title.Title_Accuracy1_Harpoon - 30% - - - "Harpoon"
Title.Title_Damage1_Destructor 15% - - - - "Destructor"
Title.Title_RocketLauncher - - - - - "Rocket Launcher"
Title.Title__Launcher - - - - - "Launcher"
UniqueParts.Leviathan_barrel1_3shot -20% - 80% - - It is based on barrel1_3shot. Apart from its unique effect, it also has superior stats/ +4 rounds. 50% reload speed. 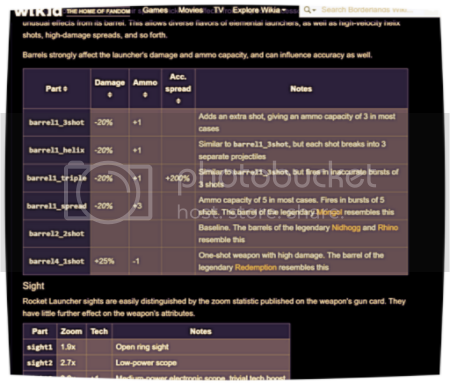 UniqueParts.Leviathan_Material - - - 5 - no stat modifiers/ " C"
UniqueParts.TheRoaster_acc5_Incendiary - - - 6 - It is exactly the same as the standard acc5_Incendiary accessory, apart from increased tech level, which has [no effect on Rocket Launchers]/ "The Roaster"
UniqueParts.TheRoaster_Material - 23% - 5 - almost as good as Material_Maliwan_3/ 23% reload speed/ " C"
Rocket Launcher parts are fairly simple, as any combination of parts may spawn together to make a particular launcher.